Andrew Simpson dead: Did the British sailor drown because the America’s Cup boats are too dangerous? 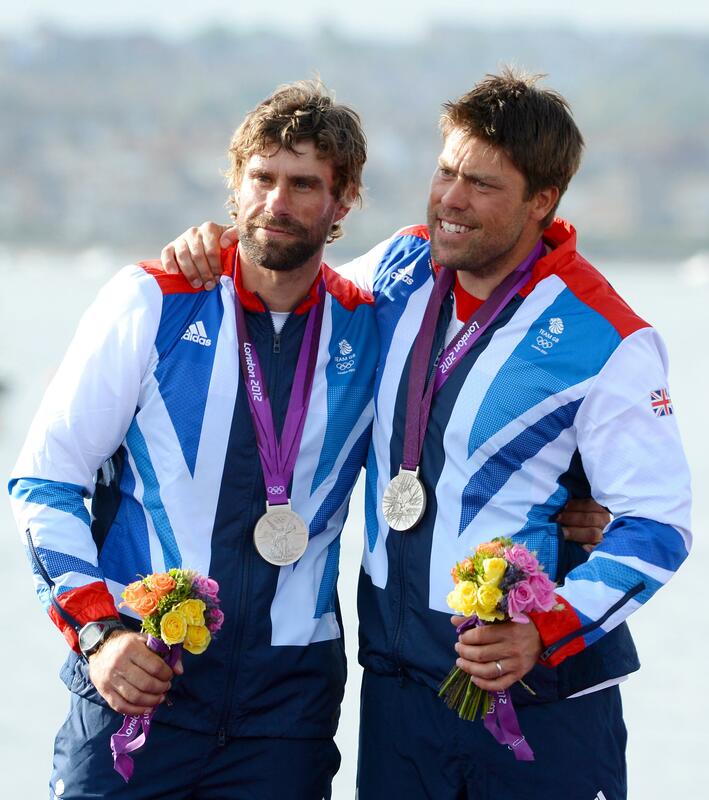 Andrew Simpson (R) and Iain Percy celebrate after winning the silver medal in the Star sailing class at the London Olympic Games. Simpson drowned on Thursday during preparation for the 2013 America’s Cup. On the America’s Cup website, there is a description of the AC72, the new class of boat that’s being used in this summer’s races. The AC72’s design “challenges the very best sailors in the world, pushing them to their limits … and beyond,” reads the breathless copy. It’s unfortunate phrasing, given the death today of sailor Andrew Simpson. Simpson, who won a sailing gold medal for Britain in the 2008 Olympics, drowned after the AC72 he was training on capsized in San Francisco Bay. The tragedy is sure to raise questions about the catamaran’s design, and whether it’s simply too dangerous for competition. “These are by far the most extreme America’s Cup boats we’ve ever seen,” says Justin Chisolm, editor of Sail Racing Magazine. I spoke to Chisolm this evening, as details of the incident involving the Artemis team’s boat were still emerging. It’s not clear if there was a structural failure that caused the crash (Chisolm thought he spotted a break in one of the hulls, though that could have occurred after the boat had already flipped) or if the boat simply lost control at high speed. Either way, a disaster like this was not entirely unexpected. Back in October, the AC72 belonging to Larry Ellison’s Oracle team flipped while training in the same waters. A Wired story about that incident is titled “The Boat That Could Sink the America’s Cup.” The concern at that point was less about crew safety than about the potential expense and delays involved (both dangers to running a smooth Cup event) if the AC72, a design pushed by the billionaire Ellison, turned out to be irredeemably capsize-prone. One of the sailors quoted in that story was the CEO and tactician of the Swedish Artemis team, who predicted that another crash was all but certain. “It will be a miracle if we get through the summer without it happening to somebody,” he told Wired. Whenever a cat flips—and especially a massive cat like this—there’s the danger that a sailor might be trapped beneath the overturned boat. That appears to be what happened here. Early reports suggested that Simpson was pinned underwater for 10 minutes or so. I’m not sure the average spectator can tell the difference between a sailboat race in which the two boats are at all times on the edge of catastrophe and one in which they’re both just really fast. The rich people operating these teams may have fetishes for expensive designs, but I simply want to see expert sailors squaring off against each other, using identical equipment, such that skill and not material provides the winning margin. If I ran the Cup, I’d make an announcement tomorrow: Let’s ditch the AC72s and go old school—we can race comparatively pokey 12-meter monohulls with soft sails, like the Cup used to use. It’s not about the boats, it’s about the people in them. The competition officially begins on July 4.